“The increasingly rich and well-schooled Taiwanese [emphasis added] aren’t like the mainland’s 700 million, little-educated peasants whom the communist leaders usually manipulate. Yet last week Beijing treated the people of Taiwan [emphasis added] like dupes by meddling in their politics in a foolhardy way… These crude good-cop bad-cop antics by China [emphasis added] only further Taiwan’s [emphasis added] steady drift away from the mainland in everything but business ties. How can one keep from laughing out loud, when the Christian Science Monitor’s heavy-handed, patronizing spin control so perfectly exemplifies political scientist Michael Parenti’s scathing observation? How do these lapdogs of the national security state reverse the roles of victims and victimizers, warmongers and peacekeepers, reactionaries and reformers? They do it the way the Ministry of Truth did it in George Orwell’s dystopian novel, “1984,” by manipulating the language, by playing word games. Veteran China watchers are wise to their tricks, but let’s review them for the benefit of newcomers. They persistently refer to “Taiwan” as if it were the name of a political entity rather than a geographical region of China, an offshore island of China. They persistently refer to “China” as if the term applied only to that portion of China under the control of the PRC regime in Beijing. They persistently refer only to mainland Chinese as “Chinese,” giving Americans the false impression they are different from “Taiwanese,” rather than fellow Chinese who reside in different region of China. They do not do this unwittingly. They do not do this innocently. They do this maliciously. They do this to mislead the American public into believing that “Taiwan” is an independent nation rather than an integral part of China. They do this to persuade the American public to go along with applying the same “divide and conquer” strategies against China that were used against Gorbachev’s Russia, Milosevic’s Serbia, and any political entity the US government considers a real or imagined threat to the national security state. Ironically, Lien Chan is a head of state. 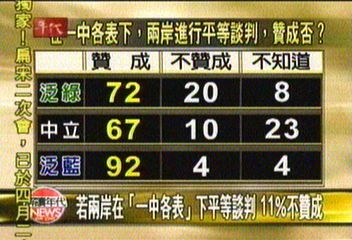 Lien Chan is the actual winner of the March 2004 Presidential Election. Lien is in fact President Lien of the Republic of China. The only reason he isn’t currently occupying the Office of the ROC President is that unlike Viktor Yushchenko, who was “Our Man in Kiev,” Lien was too proud to be “Our Man in Taipei,” i.e., a willing puppet of the US. I’m sure the 53% majority of ROC voters who cast their ballots for Lien Chan on election day 2004 got a good laugh at that, considering the fact that mainland China, in talking to Lien Chan, was talking to the leader chosen by the Chinese people on Taiwan and the government of the Republic of China! Even more ironically, ersatz president Chen Shui-bian is at this very moment considering following in Lien Chan’s footsteps. Chen is talking of officially accepting the reality of One China, traveling to Beijing, signing an interim peace treaty, thereby ensuring his place in the Pantheon of Nobel Peace Prize Laureates. This is why Taiwan independence fundamentalist Lee Teng-hui recently held a press conference during which he complained he hadn’t been able to sleep for days. The editors of the Christian Science Monitor are way behind the curve. They really need to get a clue. They need to log on to the internet and check out some websites other than their own. To see whom ROC voters on Taiwan actually voted for, see my series of articles on Taiwan’s Stolen Election. As noted above, Lien Chan is “Taiwan’s duly elected leader,” or more precisely, the Republic of China’s duly elected leader. Fortunately the increasingly rich and well-schooled Chinese people on Taiwan aren’t the little-educated peasants the Monitor thought it could manipulate. Despite the Monitor’s attempt to treat them like dupes by meddling in their politics in a foolhardy way, the Chinese people on Taiwan could not be fooled, at least not by the Christian Science Monitor. Unfortunately, these crude antics by media organizations such as the Monitor only further the Chinese people’s increasing alienation from and disillusionment with the America they once admired.